Rag rugs are both practical and beautiful. Take any of your old, worn textiles, even the ones that are too stained or shabby to be used for their original purposes, and turn them into wonderful works of art. This collection of free rag rug crochet patterns includes a wide variety of designs that all make excellent use of old fabric strips. The first step to making rag rugs is turning your rags into "yarn" for crochet. Basically, you will cut your fabric into strips and either sew or knot those strips together into a longer strip used as "yarn". Crochet rag rugs are a popular way to recycle old material. You can also purchase yarn to these rugs. Roving, super bulky weight yarn, and t-shirt yarn are all options for making these rugs. Working with thick material like fabric can be harder on the hands than working with traditional yarn. 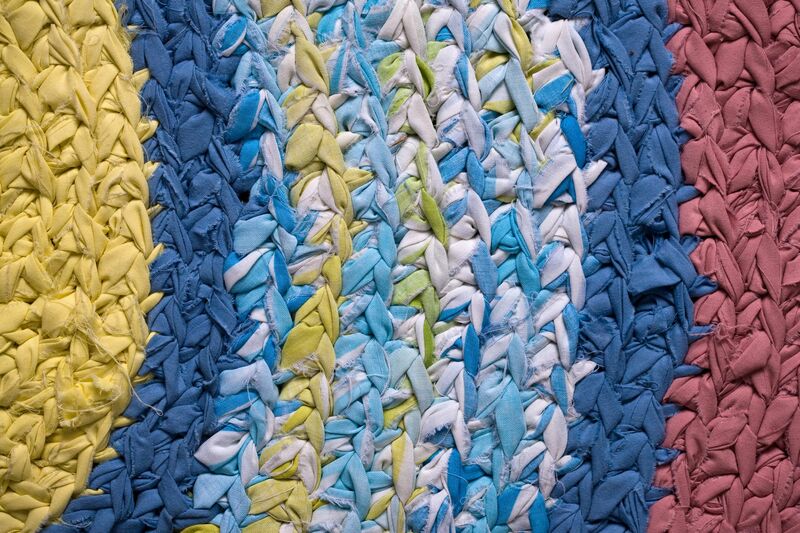 Those with repetitive stress injuries such as carpal tunnel syndrome may want to skip rag rugs or start with smaller ones. Everyone else can benefit from frequently resting your hands when crocheting rag rugs. This is a small rectangular rag rug (18 inches x 23 inches) worked in easy double crochet with chain stitches. There is enough of a stitch pattern to keep the crocheting interesting, but it's an easy design overall. The rug is super colorful when made as designed with batik fabric, but you can use any color fabric you want to create a rug of your liking. The first step is making the fabric and this pattern provides some additional instructions for making fabric strips and sewing them together. The pattern is for a single crochet rug worked in a rectangle that you can easily adapt to any size rug you want to make. There is an attractive fringe at the edges, which makes the rug a bit more eye-catching. Don't throw away old t-shirts! This rectangular single crochet rug is made from a t-shirt. The t-shirt yarn tutorial is unique and it comes with detailed photos so you'll easily see how to make this rug. It's a creative way to recycle old t-shirts. This rug from is another single crochet rag rug but this one is worked in the round. It creates a rug with a more organic shape. You could use any basic crochet circle pattern to make your own rag rug. Create something beautiful with this pattern. It is perfect for use with t-shirt yarn (as designed) but can be worked with any fabric that you have. You can also use other doily patterns worked with larger hooks and yarn to create rugs. The result is a really unique rug. In this pattern, the rug is made from old t-shirts and sheets. The small rug (16 inches x 19 inches ) is worked in the round to create a rectangular shape. You could make the rug larger by continuing to work the pattern. Each rag rug is going to turn out slightly different, depending on the materials you use and your own unique way of crocheting. One common problem with rag rugs is that sometimes they just don't lie flat. You often have to improvise a bit with your increasing to make them work out. If your rug does end up getting a bit distorted, you can try blocking it to see if that will fix the problem. Use this video tutorial to show you how to turn sheets into the fabric. It's a great opportunity for visual learners to get a sense of how to make a rag rug. Find your best learning style and enjoy the process.